This seasonal Apple Pomegranate Salad is perfect for the fall and winter season! It is so simple and highlights two seasonal favorites, Green Apples and Pomegranate Seeds . (I know I say this often, but really-- you just throw a few ingredients into a bowl!) 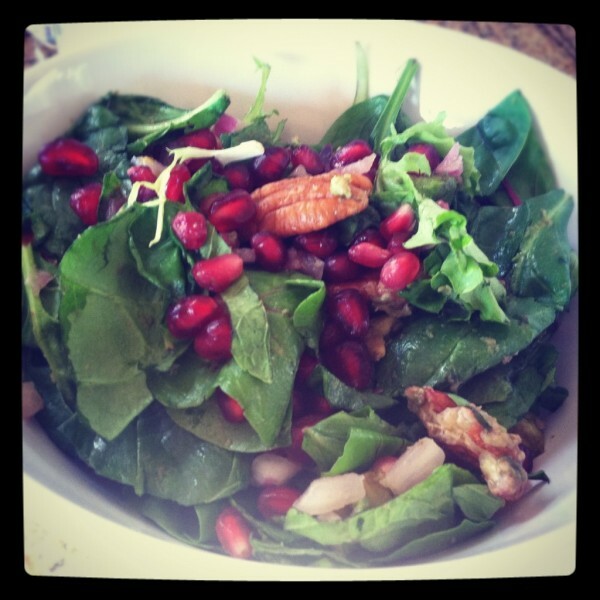 Using some good green leafy greens gives you an excellent dose of rich nutrients, and the pomegranates give you a great punch of Antioxidants! Try using my Simple Lemon Dressing for this salad! -For dressings a Balsamic Vinaigrette is an excellent choice, but I also love my Simple Lemon dressing (below). Don’t you just love salads?! So easy! ****I always keep dressing separate when preparing salad, especially when hosting others to be sensitive to others likes and especially for varying allergies and sensitivities. Many people don’t realize that many dressings contain gluten. I always keep my own special dressing handy and out for all to use! It’s a healthy, simple, and zesty option! Search for my Simple Lemon Dressing!